Doc McStuffins is a big hit in the Boo Roo and Tigger Too household and once you get the theme tune in your head it will be there all day. With a wide range of toys and games available Doc MuStuffins appeals to both girls and boys. We have several Doc McStuffins toys including the Doc McStuffins Mini Clinic Playset and Doc McStuffins Sharing is Caring Dominoes Game both of which have provided hours of entertainment for both Roo and Tigger. So when we were offered the opportunity of reviewing the Doc McStuffins Spotty Lambie Playset I didn’t hesitate in saying ‘yes please‘. Lambie is not feeling well! Rub the magic sponge onto her red spots and they magically disappear. Lambie is better! Includes Lambie, sponge, plaster cast and lots of accessories to help Lambie recover! Poor Lambie isn’t feeling very well and is covered in spots, she needs help to feel better again. 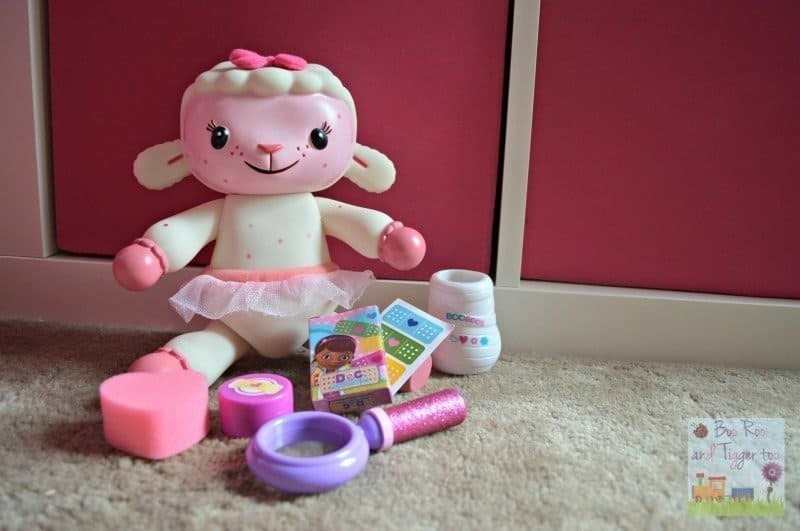 Armed with a selection of medical supplies your little one needs to work their magic to help Lambie feeling like her normal self. Using the heart shaped sponge or their fingers simply rub the spots on Lambie’s body until they disappear (they will return after a few seconds). Check Lambie over with the glittering magnifying glass, add a cast to mend her paw or even pop on a plaster to heal her wounds. With Lambie and the medical supplies the opportunities to help her are only limited to your little ones imagination. The set was much bigger than I had anticipated with a full size Lambie and easy to hold medical supplies it really makes caring for Lambie easy for little hands. Roo especially was taken with the set and added some of her doctors box of bandages, cotton wool and slings to fully take care of Lambie. The spots take a little rubbing to get them to disappear and we even held a little competition to see who could get the disappear the fastest. Available from Flair, Amazon and all other good toy retailers for around £20, which represents good value for money considering the interaction your little ones get with Lambie. 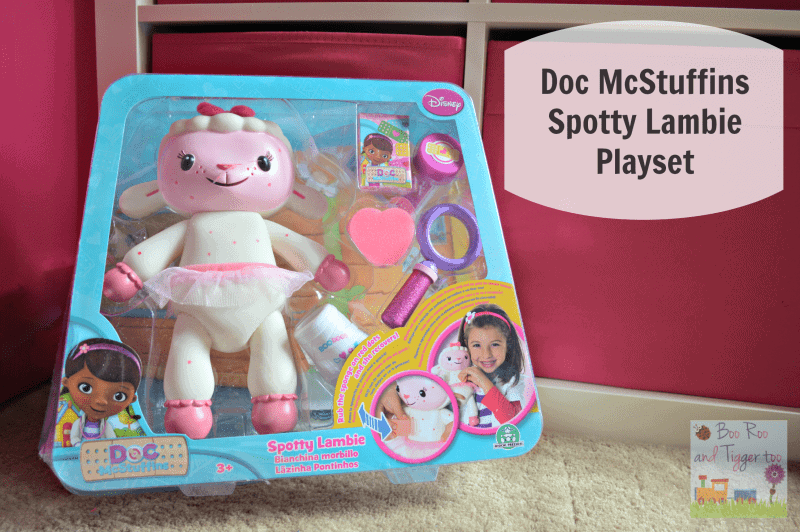 Disclosure: We received a Doc McStuffins Spotty Lambie Playset FOC for the purpose of review. What a lovely set, and perfect for teaching little ones about visiting the doctor or hospital! I imagine this would be a huge hit with my little girl who likes to play Dr!